I have something a little different today, slightly along the lines of those day to night posts (here and here) from before, sort of tutorial-y. I've mentioned again and again that I love layering in the winter. It's really what gets me through this season as I do not have the warmest of wardrobes (I have never ever in my life worn long johns!). So layering keeps me cozy and it allows me to wear even the summery pieces I own in the winter months, remixing at it's best! So here I have a look, started from "scratch"and built to it's grand finale layer by layer. Let's start with a breezy chiffon tank and leggings, a look in itself that, if gutsy enough, one could wear alone perhaps during those in-between seasons. I feel a little uncomfortable and sort of "naked" with just this on so let's move on, shall we? 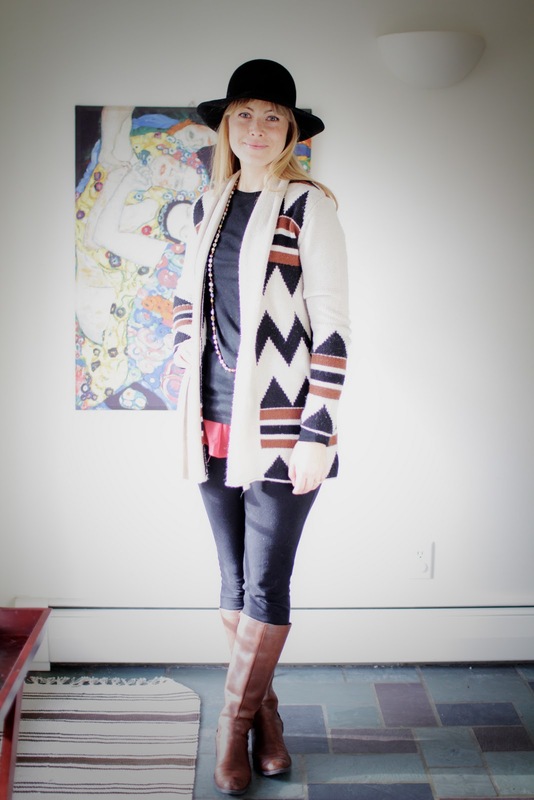 ... layer a cozy cardi, which just so happens to add a bit of flair to the look with it's southwest inspired print. This too is perfect for all sorts of occasions, from running around town with the kids to meeting your girlfriend for a quick lunch. I love wearing both the first layer look and the second. And finally, the big shebang at the end. Layer on the accessories for the "wow!" factor. I could do a date night in this final look. Some of you would prefer to stay at look #1 and others might take it a step further, adding a furry coat and fringed bag. Whatever makes you feel like a thousand bucks!